LA-based artist Thierry Guetta, aka Mr Brainwash, made famous in the Banksy documentary Exit Through The Gift Shop, talks about putting on his first UK show in London. When halfway through the documentary 'Exit Through The Gift Shop', British graffiti artist Banksy turned the camera on to amateur film-maker Thierry Guetta, an overnight star of the Los Angeles art scene was born. Despite having no real artistic background, other than a cousin who happens to be a French street artist, the vintage clothing store manager held his first show under his new moniker Mr Brainwash. Guetta even attended the Oscars after the film was nominated in the best documentary category; but Bristolian stencil artist Banksy was conspicuously absent from the ceremony. Since then, Guetta has designed a Madonna album cover, worked with the Red Hot Chili Peppers and exhibited his Jeff Koons meets Warholian-inspired pop art all over the world. A show in London last year ended with a collector reportedly buying half of the work on display. "There are things that happen in your life and you just have to be positive about it," he explains ahead of his debut solo show. "You don't calculate for it, things happen and you keep going." In his paint splattered jeans and biker jacket and from beneath his customary trilby and aviator-style sunglasses, Guetta looks every inch the heavily-bearded art world rock star. However for many critics and sceptics; that's the problem. The sudden rise in Guetta's success was a little too dreamy, leading to suggestions that Mr Brainwash doesn't really exist, and that Guetta is nothing more than a charismatic frontman for a particularly complex gag being played on the art fraternity by notorious joker Banksy. "It's a movie that brought a lot of questions," he says. "Some people watch it and they have a debate, 'Is he real or is it a creation? Is he Banksy?'. But I work and try to put my heart into everything that I do. "It's only the beginning of me, I'm not going to stop". Yet Guetta is happy to admit that "Banksy pushed me, like Forrest Gump being told 'Run, Forrest, run' and three years later, I keep running". Despite Guetta's popularity; not everyone is a fan. The artistic merits of a triptych of portraits of Elvis Presley holding a toy machine-gun guitar-style or a giant boombox made of wood is open to debate. The Londonist added: "His brash style can often leave pieces feeling cluttered... but at other times his cheeky humour shines through. "Reviews aside, Guetta has also faced legal action over his use of copyrighted images of artists like Run DMC and Jimi Hendrix. The Beatles feature in several of Guetta's works; and then there is the question of how many of the pieces were actually made by him. Surrounded by a team of talented young artists, Guetta acts more like a supervisor of a team of graphic designers. The criticisms echo those made of British artists like Damien Hirst who employs a team of "assistants" to help him. Guetta brushes them off with a broad smile: "You're just a little man and you cannot do everything by yourself, you cannot build a giant 20ft gorilla and screw in every screw, sometimes you need people. He continues: "It's 2012 and it's the way that art is today, like, Gustave Eiffel who built the Eiffel Tower, he wasn't on his own using a screwdriver or bolting it together. It comes to a point where making it in your head and making it reality, it becomes art to me because if not, it wouldn't exist." The 20ft gorilla Guetta refers to is the centrepiece of his exhibition inside the cavernous space of the Old Sorting Office in London's West End.Made using old rubber tyres, it brandishes a huge paintbrush dripping with pink paint. Weighing in excess of a tonne, workmen are busily installing huge bolts in the ceiling which will help stabilise the creation with heavy duty wire.Working day and night to put the huge exhibition at the Old Sorting Office together, Guetta acknowledges he has a lot of pressure on him. "This is the first time that he has been inside," he grins. "It was influenced by New York but now he follows me around". "This is my first show in London and London is very powerful in the world of art so I knows it's going to be hard." London 2012 visitors to the makeshift gallery are also catered for, thanks to a huge set of Olympic rings made from buckets of paints. The real question on everybody's lips is will his friend Bansky make an appearance at his show? A request for a quote from the elusive artist was denied. However, Guetta insists the pair still "keep in touch". "We made something that left a mark in his life and my life. Banksy pushed me and three years later, I'm still making shows." "I live day by day and do the best I can do every day, from my heart." 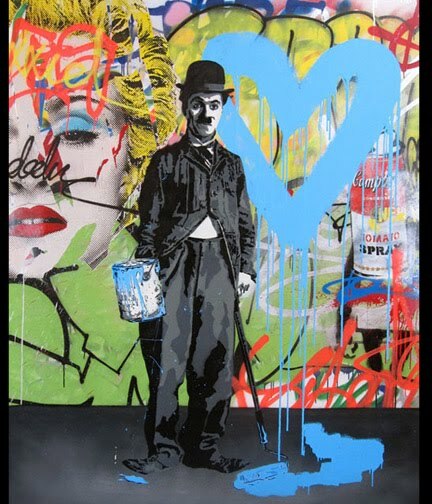 Entry is free to the Mr Brainwash show, which opens at the Old Sorting Office in London from 5 August.